Back in March, the retreat centre (The Sabbath House) called and said I’d be the only person there that entire week. 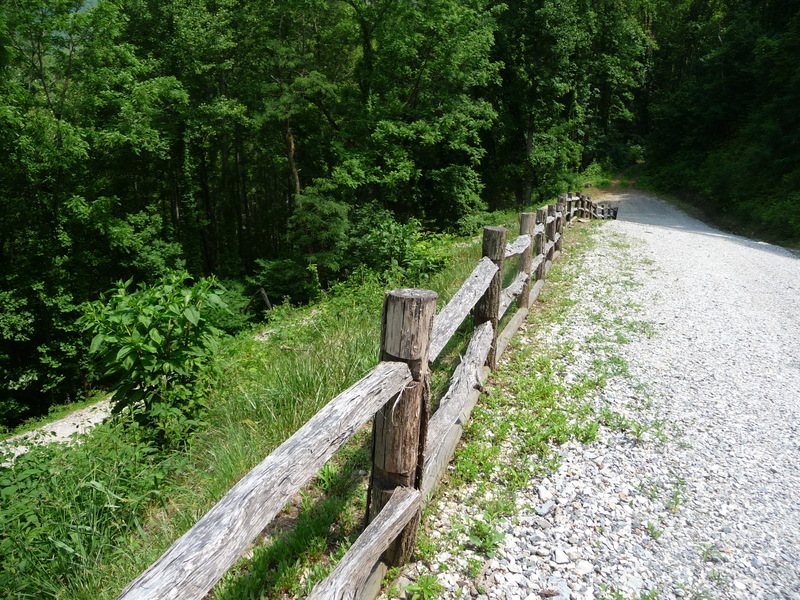 So it really was a private retreat – I had the run of the whole mountainside to myself! I am laughing as I write this because one of my staff members is so amiable and sociable that she told me she couldn’t do a solitary retreat. I think she wonders about me! 🙂 Well, I admit I wasn’t sure if I’d like this much solitude either, but it turned out well. And I wasn’t as disconnected as I thought I’d be. They don’t advertise that they have wireless Internet, but they do. That was helpful because I could look things up while I was going through my notes from the trip. 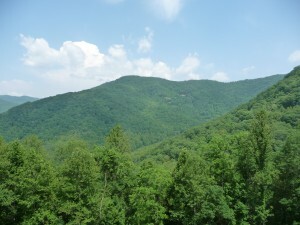 I set my GPS for the fastest route and it took me to Knoxville and then on Rte 129 across the Great Smoky Mountains. Rte 129 turns out to have another name: The Tail of the Dragon! It has an eleven mile section with 318 curves, mostly switchbacks, that added about an hour to my drive. I’m told that GPS units usually send Sabbath House guests on this route and it is the worst one to take if you just want to get from here to there. Thousands of bikers come from all over to drive it. 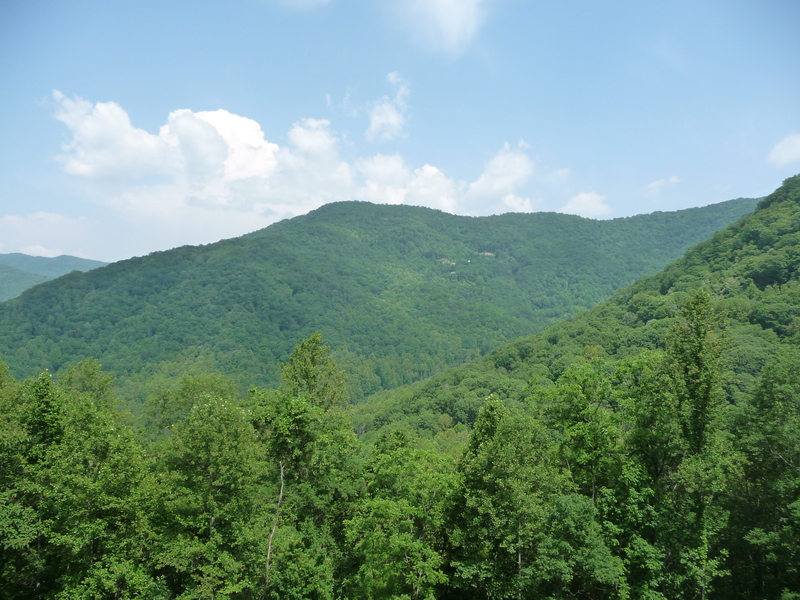 I’m sure the Tail of the Dragon has some gorgeous views, but a driver should never see them. In fact, there is a map showing where all the biker deaths have occurred (and the kind of bike involved – after all, it’s a biker’s map!). I assume when the map says “off road” that most people just sailed off the mountain while looking at the scenery rather than the road. The last part of the driveway at The Sabbath House. Nearly there! The Sabbath House is about a half-hour drive from Bryson City, NC.The last kilometre up the mountain is gravel road and very steep, the steepest incline I have ever driven on, and it has some switchback corners.The directions say to use low gear and do not stop. I put the car in second gear (which I thought was low enough) and away I went. It would have been a nail-biting drive except I couldn’t pry my fingers off the steering-wheel to bite my nails! Several times I thought the car was coming to a stop and I sure didn’t want to back down the road, and I knew that if I stopped, I wouldn’t get going again. I was also really concerned about getting around the corners. However, I did make it to the top! 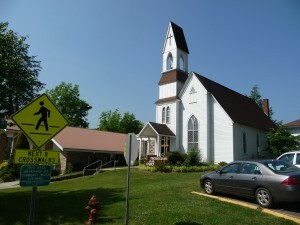 I went to Bryson City Presbyterian Church where my friend from the DMin program Terry Hanna is the pastor. I’ve been slowly visiting all of my cohort to see them in their home locations. I had a nice lunch with her and her husband and then it was back up the mountain where I stayed until I left at 6:15 Saturday morning to return home (a 14 hour drive because of Cincinnatti!). Going back up the Sabbath House road was much easier because I used low gear rather than second, I knew I could make it to the top because I’d already done it, I knew the switchbacks had more room available than you can see when you are coming up, and I also knew when the driveway would end! 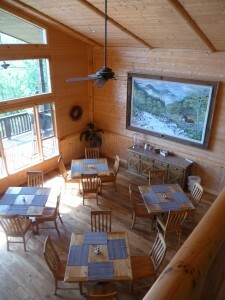 The lodge is an excellent place for either a personal or a group retreat. 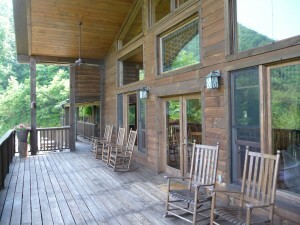 It is a lodge and not a resort, so it is a place for meeting and reflection. There are lots of outdoor activities in the area if you want do rafting, hiking or whatever. (I walked down and up the mountain twice just to get outside a bit.) The lodge has a gorgeous view of the Smoky Mountains during the days and the night skies are dark – perfect for star-gazing. I wished I’d brought my telescope! I’ve seen some beautiful nebulas and galaxies from Ontario, but being this much farther south there would be some that I can’t see from home. The lodge is only a few years old and has lots of different ‘zones’. The open lower floor has one part set up with a large boardroom table and AV equipment, while the other part is set up with a sofa and chairs for group discussions. 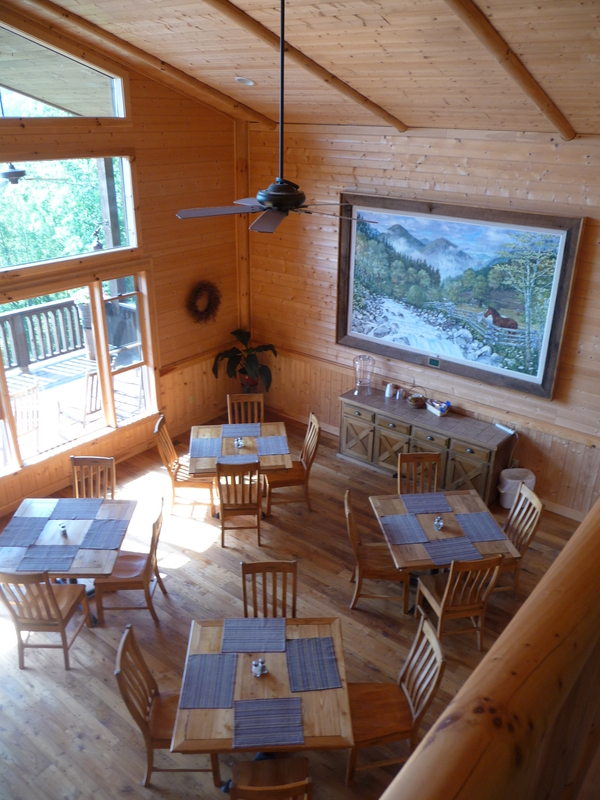 The main floor is also open space with dining on one side and a living room/fireplace arrangement on the other. Of course there are floor to ceiling windows to take advantage of the spectacular view. A loft has a baby grand piano (so I could play hymns each morning to my heart’s content) and some comfy seating as well. Outside, two levels of decks have a fire pit, a hammock and lots and lots and lots of rocking chairs. After sitting in one area for a while, I had ample choices for a change of scenery!!! The Sabbath House was intended as a place for pastors to have a quiet retreat, but anybody can go. I found it a restful and refreshing way to close my sabbatical. It gave me an opportunity to go back over all my notes from the 66 meetings I held and begin to draw some conclusions. I was quite ready by the end of my time there to come home and enjoy the last week of my sabbatical with my family!!!! I am very aware that in coming back to work I am literally coming down from the mountain top where I have been thinking about strategy and the future of CCCC. Unlike Moses, I don’t plan to come down with anything written on tablets of stone, but I am coming back with careful reflection on what I have seen around the world and some observations that I would like the staff to think about. I have one final post I will do about the sabbatical that I’ll probably put up in July or August. I plan to have a few guest writers contribute to it because I’d like to close with some other people writing about the sabbatical from their perspective. I will also be going through my pictures and uploading a few to each of the sabbatical posts. You won’t want to miss those. I’ll post a quick note when they are done so you can go back and take a look at the places I’ve been writing about. Meanwhile, tomorrow (June 10th) is my first day back at the office since February 25th. I only ever asked one question while I was away and that was, since our year-end is March 31, “How much was the surplus?” The staff asked me to look at two documents while I was away. Heather Card had the criteria for when I wanted to be contacted, and I felt these documents were appropriate. Otherwise, she handled everything herself. I’ll be meeting with the CCCC board on the weekend and Monday, and then I’m into writing my workshops for the CCCC Conference in September. This conference is always a highlight of the year as hundreds of ministry leaders get together to learn and to share their best ideas for leading successful churches and ministries.